CAPS is dedicated to working with students to provide services that can assist with challenges that have impacted their overall well-being. These could include adjusting to life events, relationship issues and mental health changes. Some of the ways this can be accomplished are through individual or couples counseling as well as psycho-educational groups. CAPS uses a short term model of therapy for individuals and couples, which assists students, faculty and staff in addressing issues or concerns in about 8 - 10 sessions. We have competent staff that are trained in these modalities (meet the staff). 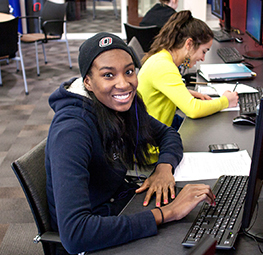 UNO counselors have a large referral network for individuals needing longer-term support. Participation in groups, however, has no session limit. The goal of CAPS is to provide services to best meet the needs of the students within our current scope of practice. Short-term counseling may not be the best method to meet the needs of all students. Some areas of concern might be better addressed by a professional with more specialized expertise or by someone who can provide a long term treatment model. The staff will work with each individual to determine the best course of action, such as referral to a UNO counselor, referral to a group, or referral to a community provider. Counseling staff work closely with Nebraska Medicine Health Services to provide on-campus referrals and collaboration with their services. In the case that an outside referral is recommended, counselors will assist in providing a community referral that will best meet the needs of the individual. The decision for a community referral will typically occur within the initial intake assessment but may also occur during the course of counseling services as appropriate. If you, or a friend, are not a student at UNO, and therefore not eligible for our services, counseling is available through the College of Education Community Counseling Clinic. More information can be found at the Community Counseling Clinic website. Information regarding Alcohol and Drug support services can be found here. The information for the current groups we are offering can be seen below. Mavericks ask for help when they encounter difficult academic and personal situations. There are so many caring people and resources dedicated to supporting your success. View all on-campus support groups. Your first appointment will consist of a 60-90 minute intake assessment. When you arrive, you will be given a short amount of paperwork to complete. Once the paperwork is completed, your counselor will bring you to their office. During this initial intake assessment counselors will gather information through a conversation with you, in order to build a big picture of your primary concerns. The intake is the start of counseling and is crucial to determining the direction of services. After the initial assessment, counseling staff will discuss with you the best course of action. This may include setting up an appointment with a UNO counselor, a referral to a community provider, a referral to a group, or other referrals as appropriate. For your first appointment it is helpful if you arrive approximately 15 minutes early in order to fill out paperwork. The paperwork will allow us to get some background information from you prior to your appointment. Legislature of Nebraska (LB 982) provides for minors 18 years of age and older to consent to mental health services as prescribed. If you are under the age of 18 you must have a parent or legal guardian sign a Consent to Treat a Minor Form. The form can be downloaded below and brought to your first appointment. Questions related to the Consent to Treat a Minor Form are always welcome. Please call 402.554.2409 during regular business hours. The Age of Majority in Nebraska is 19 years old. If you are under the age of 18 we will need to get signed consent to treat from a parent or guardian. In addition, we will need their signature to release information. Mandatory reporting laws exist for child abuse issues related to abuse, neglect and sexual assault of a minor (child). The links below can be used to find out more related to Nebraska Law and reporting issues related to minors. If you have any questions about confidentiality, your counselor will be happy to discuss them with you. CAPS is eager to help create a vibrant, safe campus community in which psychological health and academic life flourish.